This research is courtesy of Sander Duivestein, professional speaker and trendwatcher at VINT, the International Research Institute of Sogeti, and Patrick Savalle, founder and technical director at Mobbr crowd payments. Bitcoin is big news again. The digital cryptocurrency is on the frontpage of every major newspaper. This week its price collapsed because the largest exchange on the network did not handle a known design flaw in bitcoin properly, which caused widespread disruption and possibly some loss of bitcoin. As a precaution, several exchanges had to close their virtual doors till further notice. Economists have warned of the above scenario several times. No central authority backs this virtual currency. Investing in bitcoin is equivalent to pure speculation. It’s the new Tulip-mania. Money can therefore disappear like snow in the sun. In addition, the currency is discovered by the criminal world and it is used widely to money laundering. Bitcoin is purely “evil“, as Paul Krugman, a Nobel Prize-winning economist, recently proclaimed. But there is more to the story than the economists tell. Of course there is no denying that the latest incident is a reminder that bitcoin is still an experiment. The real story of bitcoin however, is more complex. In this research paper we hope to explain that the bitcoin currency itself is ‘just’ the next phase in the evolution of money – from dumb to smart money. Similar to when the TCP/IP, HTTP and SMTP protocols were still in their infancy; the Bitcoin protocol is currently in a similar evolutionary stage. Contrary to the early days of the Internet, when only a few people had a computer, nowadays everybody has a supercomputer in its pocket. It’s Moore’s Law all over again. Bitcoin is going to disrupt the economy and society with breathtaking speed. For the first time in history technology makes it possible to transfer property rights (such as shares, certificates, digital money, etc.) fast, transparent and very secure. Moreover, these transactions can take place without the involvement of a trusted intermediary such as a government, notary, or bank. Companies and governments are no longer needed as the “middle man” in all kinds of financial agreements. Not only does The Internet of Things give machines a digital identity, the bitcoin API’s (machine-machine interfaces) gives them an economic identity as well. Next to people and corporations, machines will become a new type of agent in the economy. The Bitcoin protocol flips automation upside down. From now on automation within companies can start top down, making the white-collar employees obsolete. 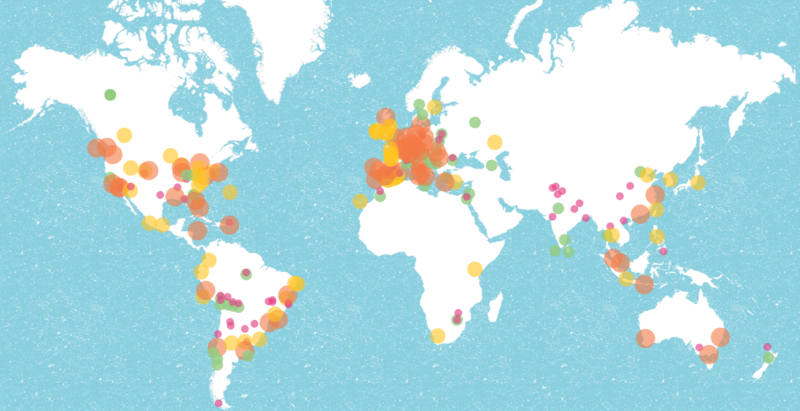 Corporate missions can be encoded on top of the protocol. Machines can manage a corporation all by themselves. Bitcoin introduces the world to the new nature of the firm: the Distributed Autonomous Corporation (DAC). This new type of corporation also adds a new perspective to the discussion on technological unemployment. The DAC might even turn technological unemplyment into structural unemployment. Next: Is your business ready to be disrupted? Are you? Is your business ready to be disrupted? Are you? “Beware the mania for Bitcoin, the tulip of the 21st century.” This statement was recently made by Jean-Pierre Landau, a professor of economics, in an opinion article for the Financial Times. There is a lot of confusion about bitcoin. It is really hard to define the “ irreducible core” of bitcoin. Part of the problem is that a clear definition of the digital cryptocurrency and a good explanation of the workings of the underlying platform is missing. The other part of the problem is that lots of people only focus on the volatility of the currency and the “fact” that the money is invented to support criminal activity. Most importantly, Bitcoin is still in its infancy, just as 20 years ago when the internet protocols TCP/IP, SMTP and HTTP were introduced. Their impact was not understood at the time. And that’s not so strange. Talking about bitcoin, there are basically two camps. The economists are dismissing bitcoin as a new ponzi scheme, while technologists view bitcoin as the biggest invention of this decade. Who do we have to believe? So what does Andreessen envision that the economists don’t see? It’s not the digital currency, but the underlying platform that will cause an enormous market disruption. Bitcoin is more than just another currency, it’s “an Internet” for registering and transferring property. In this research paper we will not discuss the shortcomings of the digital cryptocurrency bitcoin, on “why bitcoin could fail“. Instead we will focus on the underlying Bitcoin protocol, on the platform, and attempt to clarify its importance. “A specter is haunting the modern world, the specter of crypto anarchy.” This is the beginning of the “Crypto Anarchistic Manifesto” by Tim May. This first sentence in the manifesto is a nod to the 1848 “Communist Manifesto” by Karl Marx and Friedrich Engels. Just like the communist manifesto, the crypto anarchic manifesto is about dispensing with government interference. In this case, the advances in information technology will stamp out government regulation. According to May, computer technology was about to reach the point where it is possible for individuals and groups to communicate and perform transactions in a completely anonymous manner. Two entities can exchange messages, transact business and enter into contracts, without ever knowing the name or legal identity of the other party. Thanks to cryptography, interactions are untraceable and tamper-proof. The result could be that governments might lose complete control of the economic marketplace. May’s prophecy was already known in limited circles in 1988. However, the document wasn’t actually published online until 1992. In the meantime, it has taken on a cult status among techno-anarchists. The arrival of Bitcoin has led some financial experts to now take the manifesto very seriously. Some of them refer to several Dark Web initiatives, like the online black marketplace Silk Road or Assassination Market, a kickstarter for assassins, to explain how bitcoin is changing our world into a true dystopia. However, most experts believe the Bitcoin protocol will cause a revolution equal to the Internet itself. After all, who would have thought that email would end up making the paper letter, fax, and postcard obsolete back in 1997? Just as Google, Napster, Youtube, Facebook etc. have transformed the way we interact with content, the Bitcoin platform will revolutionize the world of finance. Contrary to the early days of the internet, when only a few people had a computer, nowadays everybody has a supercomputer in its pocket. The Bitcoin protocol is a “Big Bang Disruption” that will kickstart an age of accelerated innovation. Bitcoin truly turns the world around. A problem mathematicians have been working on for a long time is how different parties can know if information exchanged online represents the consensus, without the need to rely on a third party. Until recently, this was considered impossible. When creating digitally money, solving this problem is crucial; how else can we know to whom which coins belong? The mysterious Satoshi Nakamoto, the presumed creator of the Bitcoin protocol, managed to solve this fundamental problem. While doing so, he stumbled upon something much bigger. Bitcoin is a decentralized way of recording and transferring ownership rights (not just money) in the presence of untrustworthy parties, without the need for a trusted intermediary. The network in its entirety acts as the trusted party. The foundation of Bitcoin is the block chain. 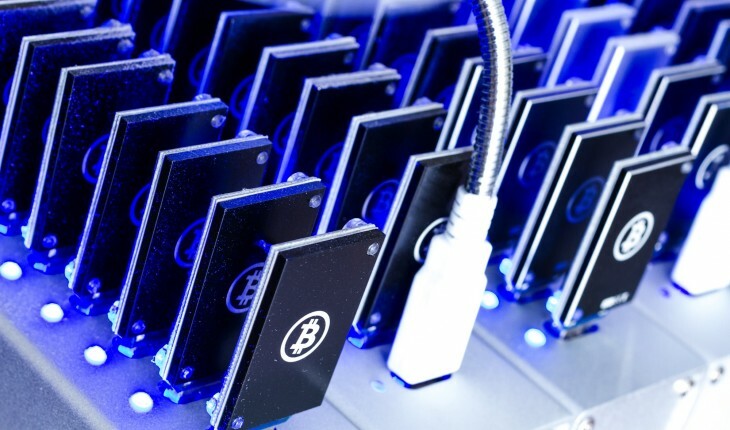 For Bitcoin, the block chain is what a ledger is for a bank. A normal bank has stacks of money locked up in a safe, with a corresponding ledger recording what money belongs to whom. This is essential. The ledger is managed centrally by the bank. This is why all transactions go through that bank. With Bitcoin, the ledger is decentralized. It is duplicated across the entire network. No single individual controls the ledger because everyone simultaneously controls the ledger. The network as a whole keeps track of which bitcoins are assigned to which wallets (Bitcoin addresses). Transactions simply pass from wallet to wallet. It is similar to how cash or physical goods are exchanged, but with the reach of the Internet. The decentralized nature of the block chain has many advantages. One of these is the impossibility of censorship (financial or otherwise) by a single party. There is also no single point of failure. In contrast to a bank’s ledger, the block chain can be inspected by anyone. Bitcoin transactions are completely transparent. This allows for complete financial openness, e.g. for public institutions, charities, etc. By default, the “account numbers” (Bitcoin addresses) that are added to the block chain are anonymous. This provides Bitcoin users with a choice between anonymity or transparency. People who publish their addresses allow a direct view of their money flows, while people who succeed in keeping their addresses hidden (which is difficult) remain anonymous. Bitcoin is pseudonymous, not anonymous. Bitcoins at a particular address can be spent by providing a corresponding unique key (a code). In normal use, this isn’t visible, because the wallet software manages it. However, it is possible to copy, print, or share the codes. To ensure that bitcoins are not spent twice and that only valid transactions are added to the block chain, all computers in the network must compete with each other to calculate a checksum (a cryptographic puzzle). The first computer that finds the solution may initially add the transaction to the end of the block chain. As more computers confirm the solution and start using the new block chain to add new transactions, the found solution will increase in probability. If the majority of the computers are searching for the same, correct solution, invalid transactions will automatically end up in a dead branch of the block chain and become extinct due to a lack of consensus. In practice, a transaction is safe after six or more confirmations. All this cryptography gives bitcoin its classification ‘cryptocurrency’. Successfully adding a block of transactions to the block chain is rewarded with newly created bitcoins, and is therefore called “mining”. Mining is Bitcoin’s solution to the Byzantine Generals’ Problem. While this mining reward is the strength of bitcoin, funding its own growth, it recently almost turned against itself. To be able to forge a fraudulent transaction, one must control the majority of computing power allocated to the ‘mining’ of bitcoins, which currently is equivalent to that of the top 500 of supercomputers. Cloud mining collective Ghash.io almost reached that majority and had to promise not to break the market in order from keeping its customers from leaving en masse. Theoretically, this risk should reduce as the number of market participants increases. The algorithms are designed in a way that only a fixed number of new bitcoins are generated each day. This number decreases every day meaning that the maximum number of bitcoins will have been generated some time in 2140. A Bitcoin economy therefore has a predictable monetary basis with monetary inflation theoretically ultimately decreasing to zero, leaving consumption and production as the only drivers of so-called ‘natural’ price inflation and deflation. However, with mining rewards from bitcoin generation decreasing, we will probably see the need for an increase in associated transaction fees. Bitcoin is the end of “dumb money”. Thanks to Bitcoin, money is now programmable, “it’s a money platform with many API’s”, which allows countless financial innovations to be created. The possibilities are virtually endless and often quite unexpected. Examples include fraud-free voting systems, digital rights management systems, new types of air miles or freebies, and festival coins for buying drinks. Imagine a car rental company issuing bitcoins linked to their fleet of rental vehicles. Each vehicle can be unlocked and started by using a corresponding bitcoin. People can book the car online and use this digital currency (which can be encrypted on their smartphone in a special app) to drive the car when they are entitled to do so. And, if they are in a hurry, the driver can issue micro-payments to other road users to get out of the way. Or what about a NSA-proof version of Twitter? Recently a fully decentralized P2P microblogging platform – Twister – was created by leveraging from the open software implementations of both the Bitcoin and BitTorrent technology. Bitcoin could ultimately give rise to a completely new generation, economy even, of distributed and decentralized companies and services. Combined with decentralized production technology such as social collaboration they can even be virtually leaderless, self-organising corporations. Bitcoin also makes it possible to automate all kinds of processes related to a transaction. The protocol contains several features that allow for payment conditions to be set, transactions to be voted on, and illegal use to be prevented, among other things. The Bitcoin protocol lowers the threshold for engaging in transactions. Not only because the transaction itself will be cheaper, but also because it will be simpler to manage any risk involved in the transaction. Before Bitcoin was discovered, similar networks had been experimented with for decades. That is, Bitcoin didn’t just appear out of thin air. It’s the story of the Long Nose of Innovation all over again. Bitcoin is “simply” the first network to have solved all the associated technological problems. Since Bitcoin has come into existence, many comparable cryptocurrencies have arisen. One of the more promising ones is Mastercoin, it’s built on top of Bitcoin and makes it possible for anyone to create their own cryptocurrency. The Mastercoin protocol is an open source project that will add many new futures to the Bitcoin block chain. In the near future Mastercoins will facilitate the creation of new asset classes, such as stocks or other ownership certificates, and create a variety of automated “smart contracts” (as already was explored in a 1997 paper by computer scientist Nick Szabo). The Ripple network is a another promising example of such a network. Although this platform has its own currency (currency code “XRP”; Bitcoin’s currency code will probably be “XBT” instead of the currently used “BTC”), it is basically currency agnostic, so it is just as easy to use euros or dollars. The Ripple network makes exchanges and other automated facilities possible, allowing frictionless currency conversion. International payments are possible at the speed of the Internet, from wallet to wallet, also without the need for a bank or bank account. This could provide the billions of unbanked people around the world with easy access to the international money market (assuming that they have Internet access). Ripple’s so-called “chains of trust” speak to the imagination. Everyone has encountered the situation where debts are settled within a group of friends. Some time ago, Pete borrowed $3 dollars from Elsa, and Elsa is now asking Pete to settle her debt of $2 dollars to John, after which Pete would only owe $1 dollar to Elsa and Elsa would be debt-free. Ripple allows this debt-exchange game to be carried out on a global scale. Paying smaller amounts becomes mostly a zero sum game, with existing debts (IOUs) being redistributed between people who trust each other. What Ripple essentially is suggesting, is a “Next Level” economy. The Internet of Things enables all types of objects to be connected to the Internet, such as computers, smartphones, refrigerators, windmills, tiny sensors the size of a grain of sand, etc. Each object has its own digital identity that can be controlled. The Bitcoin network makes it very easy for these objects to also have an economic identity, in addition to their digital identity. For example, the refrigerator can negotiate with the windmills in the area about energy use given certain conditions. The block chain doesn’t care who’s using it. “On the block chain nobody knows you are a fridge.” Bitcoin makes these transactions simple and reliable. This will completely revamp the traditional division of roles between people, organizations, and machines. The Bitcoin protocol enables a “smart” machine to participate as a third economic agent alongside humans and organizations in the marketplace. “[T]hings are going to get very messy indeed.” Companies are already having difficulty implementing B2B, B2C, C2B, and C2C models. This problem will only grow with the advent of B2M, M2B, C2M, M2C, and M2M markets. In this “futuristic” world, a soda machine can be an independent economic entity that is responsible for managing and selling its own store of drinks. It will be a machine that, in addition to selling drinks to consumers (M2C), will also be able to place orders with companies (B2M). It can even place orders with consumers (C2M) to fill its store. This will of course entail questions about who exactly is legally and economically responsible (say, if someone were to get sick from a can of soda from one of these machines, for example). Additionally, think of a service that can access the Internet to play a simple game of chess. Each time you play a game, you have to pay the service a small amount of bitcoin. When the creator of this service dies, the service dies with him, because the bill of hosting this service isn’t paid for anymore. In August 2011 Marc Andreessen published an essay “Why Software Is Eating The World” in the Wall Street Journal. In this article Andreessen describes how companies like Borders, Kodak, Disney and Nintendo are having difficulty with the digital revolution. In their book “The Second Machine Age” (2014) authors Andrew McAfee and Erik Brynjolfsson, both at the Massachusetts Institute of Technology (MIT), argue how the history of work can be described by the role that automation has played. They distinguish between two periods. In the First Machine Age, the Industrial Revolution, technology reinforces human muscle power. These machines are controlled by humans. In the Second Machine Age machines and intelligent software are automating cognitive tasks. They are climbing up the DIKW hierarchy. Google’s self-driving cars and IBM’s Watson demonstrate that artificially intelligent machines can make smart decisions. These examples of emerging technologies show that “the relationship between humans and machine is redefined”. Smart machines are taking over control. Automation is the replacement of human labor by machines or computers and computer programs. Automation normally starts bottom up. In their book, McAfee and Brynjolfsson also define automation as a bottom up process. In the First Machine Age, blue-collar workers are replaced by machines and in the Second Machine Age intelligent software takes over the jobs of the managers of the organisation (the white-collar workers). The Bitcoin protocol turns this automation process upside down. Automation starts top down. Right now we need managers to pursue the mission statement of the company. Such a company already exists. Bitcoin is the first prototype of a real decentralized autonomous corporation (DAC), where the bitcoin holders are the equity shareholders of Bitcoin Inc.
Another example of a DAC is Namecoin. 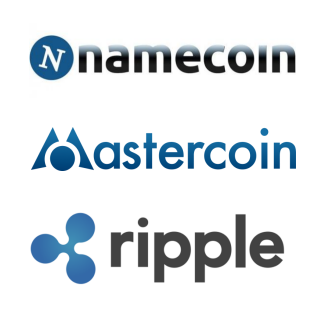 It is a corporation that is basically a decentralized service, a decentralized Domain Name System (DNS), that allows you to register and buy a .bit domain, by purchasing it with Namecoins, that are especially designed and created for this goal. A plausible scenario for a DAC could also be a fully automated speakers agency that acts on behalf of its keynote speakers. “Speakercoins” can be issued that can be bought by people, companies, conferences that want to hire one of the speakers. The DAC takes care of the bookings by automatically managing the agenda of their presenters. After a keynote has been given the DAC automatically pays the speakers by transferring the money from its wallet. Think bigger and a DAC can even be an employment agency. Several initiatives are now in development that support the idea of a DAC. One of the promising ones is Ethereum. Vitalik Buterin, a 19 year old developer from Toronto, has launched this new platform, that acts like an operating system for crypto currencies. Ethereum offers a more robust scripting language than the Bitcoin protocol that gives developers the opportunity to build Distributed Apps (Dapps). The possibilities of DACs and Dapps are endless. In the future every person and every object will have it´s own personal DAC that takes care of it´s business. Personalized DACs act like Google Now on steroids and in a worst case scenario they will become a true “Daemon”. During the Industrial Revolution hierarchies became the dominant way to organize the world. Untill now it has been the most efficient way to overcome transaction costs. The internet changed all of this. The internet makes it possible to cut down in transaction and communication costs. By doing so, the Internet introduces a new kind of firm, almost by definition. The Decentralized Autonomous Corporation (or a Dapp) represents this new nature of the firm: a company where software is in control. Within a few years we will see many new and different types of DACs – powered by initiatives like Colored Coins, Mastercoin, Nextcoin, Ethereum – that will replace centralized commercial services such as Facebook, Twitter, YouTube, eBay, stock exchanges, Spotify, Netflix, ISP’s, Gmail, online sports-books, voting booths, SSL, cloud storage like Dropbox, and much more. 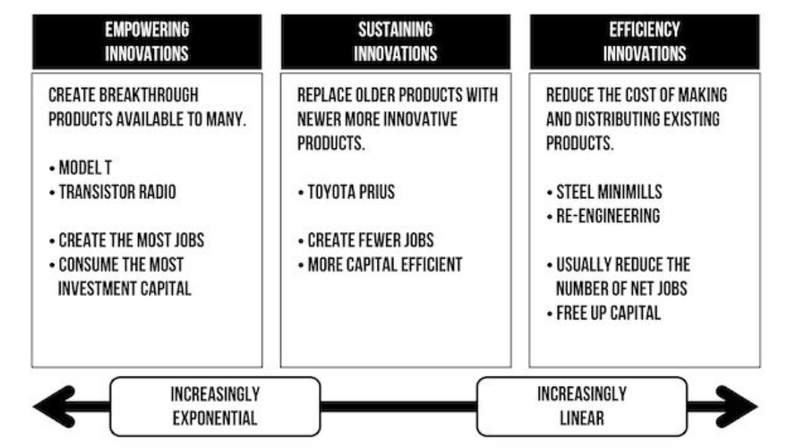 In his upcoming book “The Capitalist’s Dilemma,” author and Harvard Business School Professor Clayton Christensen distinguishes three kinds of innovation: empowering, sustaining and efficiency innovations. The solution to this problem is complicated. “Right in the middle of the Cash Flow stagnation, you have Bitcoin now, not just creating a new model for currency, but at the same time creating a new liquidity pool, that has been built on top of this vibrant, innovative economy, where now you see hundreds of startups, creating thousands of jobs, creating this incredible amount of innovation, in financial services, in cryptografie, in security, in distributed systems, in technology and we’re only seeing the beginning of this. And as this wave accelerates, it’s generating it’s own economy. […] That is the biggest disruptive potential of bitcoin. The future will not be centralized! Democratization is the transfer of any kind of power from the elite to the crowd. Bitcoin is the third democratization. The first was the Internet, it enabled the democratization of information. The second democratization started with 3D printing, it’s the democratization of manufacturing where factories become obsolete. They are no longer needed to build a product. Now we are on the break of a third democratising force. It’s the democratization of money and finance. No more monopolies that control our money and business. Bitcoin is about freedom. In this new era where technology is transferring power to the people, the world of finance will be unbundled. Banks used to do everything. Now all kinds of startups are picking of services. 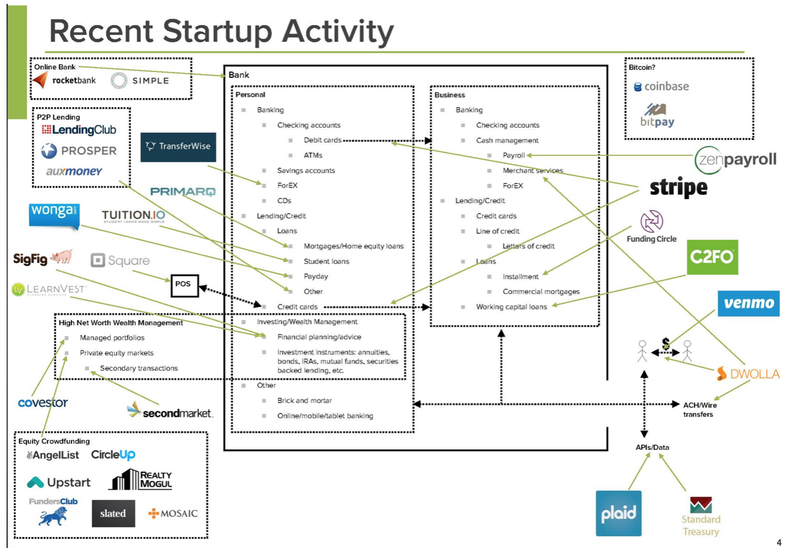 Alexander Pease, a venture capitalist at Union Square Ventures, made a great slide deck in which he showed how companies are innovating in the world of finance. He calls this process the “disaggregation of a bank”. In his opinion all kinds of startups are eating traditional banks for breakfast. Within a few years we will see many new and different types of DACs – powered by initiatives like Invictus Innovations, Mastercoin, NXT, Ethereum – that will replace centralized commercial services such as Facebook, Twitter, Youtube, eBay, stock exchanges, Spotify, Netflix, ISP’s, Gmail, online sportsbooks, voting booths, SSL, cloud storage like Dropbox, and much more. The currency application of Bitcoin was version 1.0. The block chain is Bitcoin version 2.0. Bitcoin 2.0 is real capitalism. It enables a market with true self-regulating behavior, as Adam Smith ment with his “invisible hand”. Individuals can make profit, and maximize it without the need for government intervention. “Bitcoin 1.0 is monetarism 2.0 and Bitcoin 2.0 is capitalism 2.0” as financial pundit Max Keiser so eloquently said in one of his reports. A frictionless and transparent marketplace that is executed on top of the Bitcoin platform will put a lot of pressure on existing companies. They are not used to compete with automated services like DACs and Dapps. Companies will have to make decisions with the speed of the internet, which is by definition impossible. These companies will “try to preserve the problem to which they where once the solution”. 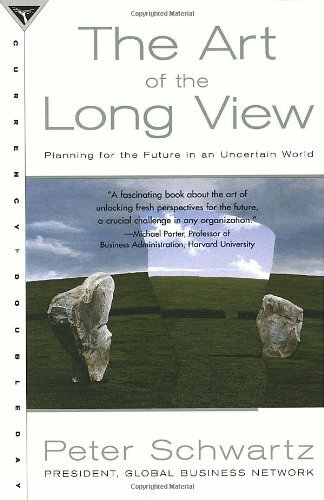 But the dramatic changes in business will unearth a major gap between traditional approaches to strategy and the way the real world will work. It is “the end of competitive advantage” as we know it. In their book “Built to Change” the authors Edward Lawler and Chris Worley analyzed the Fortune 1000 list. This list contains the thousand largest U.S. companies ranked on the basis of generated income. The study shows that a total of 35 percent of the companies in the top 20 are new in the period from 1973 to 1983. In the subsequent period of ten years, again this percentage increases to 45 percent. From 1993 to 2003 this figure amounts to 60 percent. In the article Big Business … The End is Near an answer to this question is given. If the above trend continues, more than 70 percent from the list of the Fortune 1000 companies will be replaced. In the near future, new companies will emerge that will achieve tremendous growth within no time and thereby undermine the position of established organizations. To prove his theorem Weinberg has looked at the Fortune 500 list since 1955. His research shows that an accelerated change is noticeable. Companies stay on the list for fewer and fewer years. After a few years, most companies disappear from it and their place is taken over by another one. The same trend can be seen in the S&P 500. 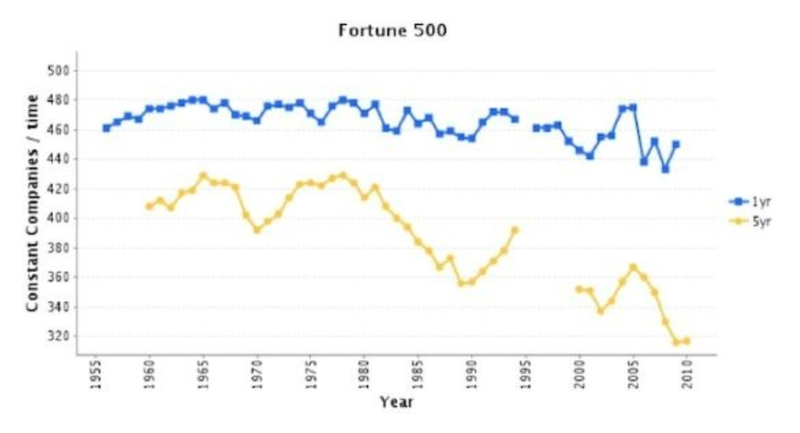 Research by Richard Foster, a consultant with the company Innosight, shows that the average life span of a company listed on the index has declined tremendously. 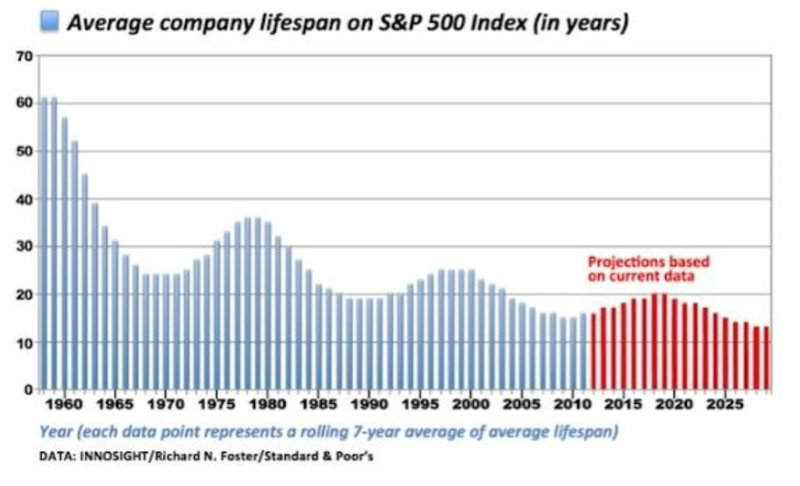 In 1958, the average life span of a company was 61 years, in 1980 this has fallen down to 25 years and now it’s only 18 years long. His prediction is that it will decrease even more in the coming years and the life span will eventually approach 10 year. In less than a hundred years, the life span of companies has decreased by 83 percent. Bitcoin will have an effect on the lifetime of existing companies. Possibly it will accelerate the trend of decreasing life spans even more. 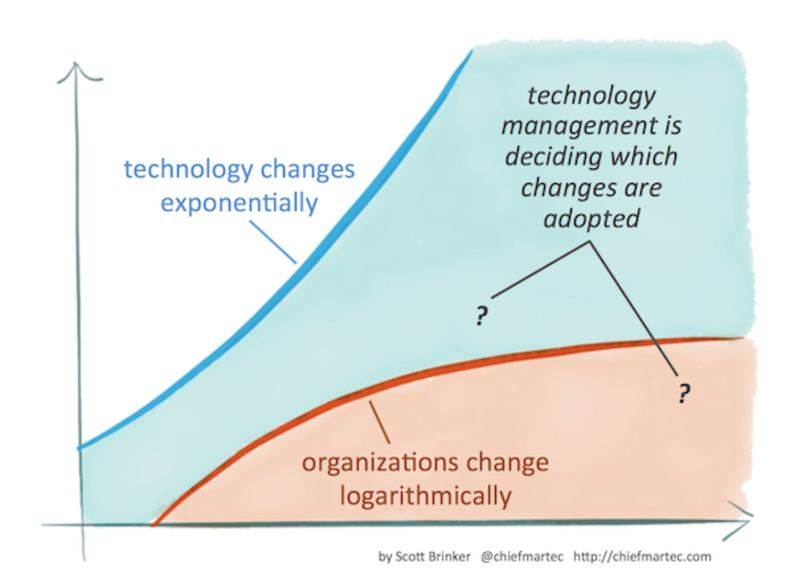 As we head into 2014, one trend will tower above them all: the power shift from big, centralized, bureaucratic hierarchies to technology driven distributed networks of individuals and communities. It’s the democratization of technology. This power shift happens in two phases of sharing. The first phase started with social media. By using all kinds of social media, like Facebook, Twitter, Pinterest and Snapchat, people are now used to share their thoughts and media online. The second phase is the sharing of the physical world, the sharing of products, services and technology in the same seamless manner when using social media. Airbnb, Uber, Lyft, Kickstarter, TaskRabbit and Coursera are the first companies that are guiding us into this future. The role of the company in this new economy is changing rapidly. The crowd is the new company and the Bitcoin protocol will be the frictionless and transparent mechanism that empowers these new kind of companies in the Collaborative Economy. “It’s a massive paradigm shift in how we live, work, play, travel, create, learn, bank and consume.” It can even impact complete countries or nations, like Iceland will probably experience with the Auroracoin. 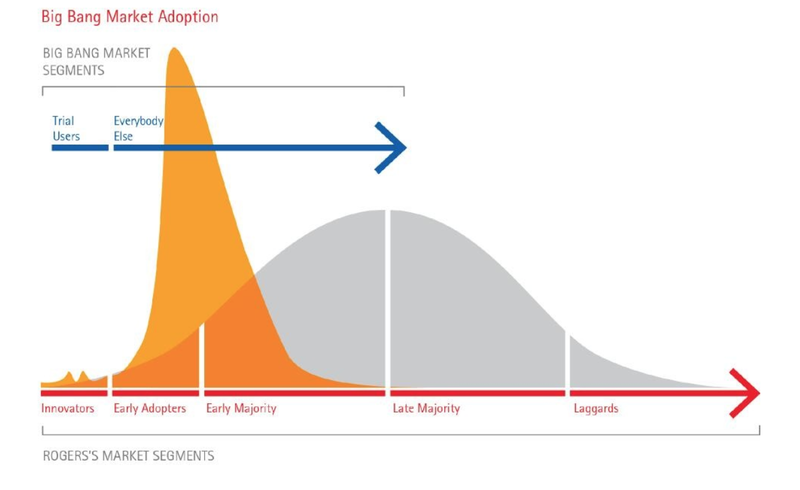 So is your business ready to be disrupted? The Bitcoin protocol might even dwarf the Internet in this regard in the coming years. New business models where trust and control will be carried out in a completely new way and the Internet of Things will lead to a new economic agent – “the machine” – being added to the existing economy. The idea that machines can participate autonomously in the economic marketplace raises concerns about (technological) unemployment. The fact that the Bitcoin block chain even supports decentralized autonomous corporations makes it even worse. Will the machines take over? Like any powerful technology, Bitcoin can either be seen as a Pandora’s box, or as a step towards Utopia. Bitcoin just obeys the First Law of Technology: “Technology is neither good nor bad; nor is it neutral”. Asking yourself whether Bitcoin will fail is like questioning yourself whether technology can be “un-invented”. It is much better to experiment and innovate with this new platform. The best strategy is to build a startup that cannibalizes their own business model. A strategy that enables companies and governments to quickly adapt to the changing circumstances, if they wish to survive. It’s Digital Darwinism! Similar to when TCP/IP, SMTP and HTTP were still in their infancy, the Bitcoin protocol is currently in a similar evolutionary stage. Bitcoin may never fully reach maturity as a currency, but given the fact that it’s underlying protocol is open source, similar initiatives will emerge using its key design elements, and one day cross the finish line because it is the “fittest”.